July 14, 2018 October 11, 2018 - 21 Comments. Peñasco has always been the beautiful stepsister ignored by the dutiful suitors who prefer the company of Taos, its more glamorous sibling. Taos, the mystical art colony to which new age subscribers seem preternaturally drawn is the terminus of the high road, starting and end point of the enchanted circle and one of the most beautiful communities in the country, if not the world. Sugar Nymphs Bistro is helping Peñasco lure some of those suitors away…at least for a spectacular meal or two. A 2002 entry into the Taos county restaurant scene, Sugar Nymphs offers a sophisticated menu that belies Peñasco’s rural simplicity while celebrating its agrarian traditions and serving its local home-grown organic produce. It’s quite simply one of the very best restaurants of any genre in the Land of Enchantment. In recognition of its bucolic setting and its outstanding cuisine, Sugar Nymphs Bistro was featured in the October, 2004 issue of Gourmet magazine, the internationally renown “magazine of good living.” It was one of eight featured rural restaurants where “the welcome is warm and the flavor regional.” Despite the restaurant’s acclaim, to some local residents, Sugar Nymphs remains “that place founded by los hippies.” Those “hippies” would be chef Kai Harper Leah and pastry chef Ki Holste, co-owners of the only kitchen in Peñasco nearly as wonderful as my mother’s. Sugar Nymphs is warm and welcoming, cozy and comforting, a welcome respite from the mundane. It has a sort of neighborly Santa Fe type place in which you can kick back in comfort, bask in the morning sunlight and imbibe the aromas of steaming coffee and delectable pastries. The dining room is homey, its yellow walls festooned with art by the chef herself. Kai Harper is nearly as adept with a brush as she is with the kitchen implements which do her bidding to create some of the best cuisine in northern New Mexico. Kai plied her chef skills in some of San Francisco’s most innovative restaurants, including Greens which is considered almost universally as one of the best vegetarian restaurants in the country. With a chef’s pedigree like that, you know you’re in for a unique dining experience. It’s a dining experience you should start with the restaurant’s signature salad, the Goat Cheese Salad. Available in two sizes, it’s playfully referred to as a “little goat” or a “big goat” and features organic lettuces tossed in sesame ginger vinaigrette with Sonoma goat cheese, dried sweet cranberries and toasted pecans. It’s one of the very best salads anywhere in New Mexico, a salad so fabulous a carnivore would give up meat for it. 14 July 2018: Growing up in Peñasco, my family tended to a rather large garden in which we raised corn, beans, pumpkins, carrots, strawberries, lettuce and other vegetables. Despite a true farm-to-table upbringing, salads may as well have been synonymous with “yech,” especially for me and my brothers. That sentiment is common among many Peñasquero males of my generation. Sadly, Sugar Nymphs didn’t open its doors until long after the salad-avoidance days of my youth. Perhaps the Nymphs’ beet salad, a simplicity itself creation of mixed greens, beets and red onions drizzled with a ginger vinaigrette would have ensnared my affections–and if not the beet salad, maybe the black eyed pea salad would have. As with the beet salad, this is a very simple three ingredient (red peppers and red onions) with a light vinaigrette. Why didn’t these simple, fresh, delicious salads exist so long ago? To gastronomes around the world, Provence equates to incomparable cooking, especially with vegetables at their peak of freshness. So, when you see Provencal Pistou (made with locally grown pinto beans, sweet parsnips, caramelized onion and tomato) on the menu, don’t hesitate. This is a must order dish. Pistou is actually a paste made from raw garlic and basil, similar to Italian pesto, but is most often prepared as a minestrone. Sugar Nymphs’ version is worthy of the Provencal region of France. It’s the perfect cure for a cold winter night. Amazingly, it may not even be the best soup on the menu. That honor might belong to a white and pinto bean butternut squash soup that may leave you swooning. It’s everything Webster had in mind when defining soup as a quintessential comfort food. 14 July 2018: There’s so much more to Hungarian food than goulash, the paprika-seasoned meat stew, but if you challenge your friends to name other Hungarian delicacies, chances are they won’t be able to do so. Just as goulash is considered an essential Hungarian comfort food, so too is Hungarian mushroom soup, a very flavorful rustic treat. On a cold winter day–and it gets very cold in Peñasco–it’s pure comfort in a bowl. Sugar Nymphs’ version is replete with fresh fungi sliced into various sized pieces. It’s seasoned with Hungarian paprika, often referred to as “Hungarian red gold” for its rich flavor, pale red color, pleasant aroma and slight piquancy. Sugar Nymphs’ rendition is terrific. The entree which captured Gourmet magazine’s attention is the Chipotle Pork Loin, sautéed pork loin served in medallions with a lively tomato chipotle cream that tantalizes your taste buds. The magazine should have dedicated its entire issue to that porcine perfection. With a seasonal menu, the fabulous chipotle pork loin may not be available when you visit, but don’t fret. The menu always includes several wonderful entrees with which you’ll fall in love–entrees such as the individual meatloaf with roasted tomato sauce. While meatloaf may be the quintessential comfort food, the Sugar Nymph’s version sets the bar. The meatloaf is seasoned with cumin, Spanish paprika, onion, garlic, oregano, tomato and cheese. It is served with potato gratin and green beans. Unlike the crusty cardboard tasting meatloaf served at many diners, this one is tender and moist. The roasted tomato sauce is fabulous, so good you’ll use it as a gravy on your potatoes. Rather than lament the absence of the chipotle pork loin, you might want to celebrate the presence on the menu of the grilled chicken with lemon pepper Pappardelle pasta. The grilled chicken is prepared the French way. It is seasoned and placed on the grill under a brick, allowing it to cook rapidly and remain moist after serving.” The grilled chicken is served with a lemon pepper Pappardelle pasta with goat cheese, tomatoes and grilled asparagus. It is a fabulous entree emboldened by the scintillating moist and tender chicken breast. In its June, 2010 edition, New Mexico Magazine celebrated New Mexico’s Best Eats, eight of the best dishes served in restaurants throughout the Land of Enchantment. Two versions of each dish–a “down-home” version and “uptown” version were selected. The magazine accorded the honor as state’s very best uptown green chile stew to the green-chile bison stew at Sugar Nymphs. It’s a well-deserved honor few would dispute. Despite being somewhat leaner than beef, bison is unfailingly tender and just slightly sweet. Moreover, it’s a delicious and healthy alternative to beef. The grilled vegetable lasagna features layers of handmade pasta with Parmesan Béchamel sauce, grilled vegetables and mozzarella and ricotta cheeses. The Béchamel sauce is positively beguiling, better than I’ve had at any Italian restaurant in New Mexico. Sugar Nymph’s innovative menu varies daily to accommodate local ingredients and keep things interesting for the growing customer base. A daily standard, however, is the restaurant’s pizza, a rectangular slate oven baked masterpiece that’s as good as pizza anywhere in New Mexico. That goes for pizza in which one solitary ingredient, say pepperoni, is featured or for one of the fabulous specialty pies. One appropriately called the “West Coast” features a succulent amalgam of marinated artichoke hearts, sun dried tomatoes, capers, caramelized onion and goat cheese. It’s a memorable pie! The restaurant does a booming take-out business with pizza being the most popular to-go item. For several decades, the closest pizza restaurant to Peñasco has been Pizza Hut in Taos. As such, that’s the pie against which all other pizzas have been measured for many residents. It’s heart-warming to see the love of this village for Sugar Nymphs pies. Each pizza is hand-tossed, made with the restaurant’s own dough and sauce and there’s only one size–approximately 14 inches sliced into eight edible triangles. The Peñasco pie starts with sauce and cheese then is topped with lots of pepperoni and freshly sautéed mushrooms. It’s made the fabulous fungi very popular in the village. Speaking of pie, the only pie in Taos county equal to or better than a sugar Nymphs pizza is the restaurant’s signature maple pecan pie topped with real whipped cream. It’s one of the few items on the restaurant you can top. A light and flaky crust establishes the foundation for this wonderful pie which is then topped with layer upon layer of rich, sweet maple and chocolate overlayed by pecans. It is an absolutely fantastic pie, one of several fabulous desserts on the menu. On Sunday mornings after church, the streets of Peñasco may seem abandoned until just before eleven when out-of-town Landrovers, BMWs and Mercedes Benz head to Sugar Nymphs where they share the gravel parking lot with mud-caked pick-up trucks. The commonality among the owners of the assorted conveyances on the lot is the desire for perhaps the best Sunday brunch in Taos county. Brunch is served from 11AM through 2:30PM. As with lunch and dinner, the menu varies, but one Sunday standard is the presence of scones, perhaps the best we’ve had in New Mexico. These scones are complementary and even though many patrons will ask to buy a dozen or so to take home, they’re not for sale (although you can order as many as you want with 24-hour notice). 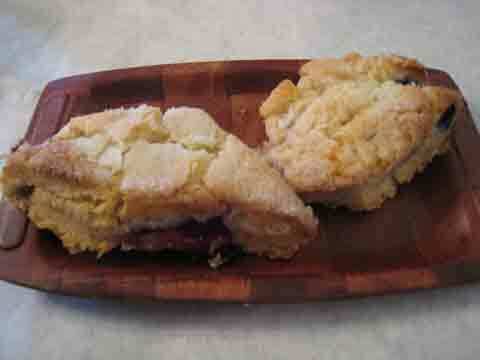 Unlike some scones which are as desiccated as the desert, these are moist and tender yet flaky. They are fruit filled and fabulous, worth getting up for by themselves. Because man and woman cannot live on scones alone, Sugar Nymphs has a fabulous brunch menu. It’s limited in the number of entrees, but very well varied. The menu includes a hot special (which might be beef stew), sandwiches and salads and not so traditional breakfast entrees such as Pantalone French toast. 14 July 2018: True New Mexicans can have green chile cheeseburgers for breakfast, lunch or dinner (and some of us would like them for dessert, too). Sugar Nymphs’ rendition is one of the very best in the state–six ounces of freshly ground choice beef with Cheddar cheese, and green chile on a housemade focaccia bun. The green chile isn’t especially piquant (except to maybe my Kim), but it’s smoky and flavorful with a pronounced roasted flavor and aroma that announces itself. Thinly sliced white onions and small plum tomatoes adorn the burger. The focaccia is hard-crusted and delicious, a perfect canvas for the other ingredients. Sandwiches are offered with soup, salad or home fried potatoes. The potatoes are papitas style–small cubes of potato perfection. Though not exactly a traditional accompaniment for a green chile cheeseburger, savvy diners will opt for the soup of the day. If it’s the white and pinto bean with butternut squash soup, you might never want French fries again. 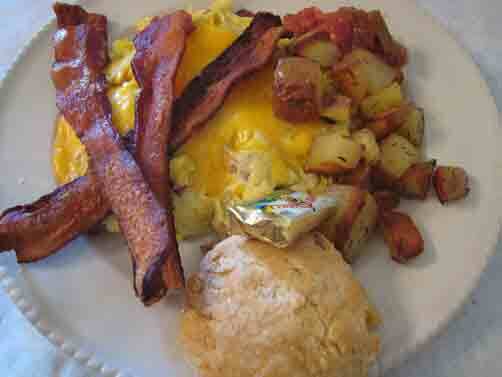 A more traditional (for New Mexico) brunch offering is Sugar Nymphs’ green chile scramble, scrambled eggs with bacon, green chile, Cheddar cheese, sweet red peppers and onions served with home-fried potatoes and a buttermilk biscuit. The red peppers are roasted to perfection, the Cheddar mildly sharp and the bacon crisp. Strawberry jelly on each table seems made just for that flaky and tender buttermilk biscuit. This is a great breakfast entree. 13 August 2017: You almost have to wonder if some restaurants, especially of the upscale genre in Santa Fe and Albuquerque, are trying to dissuade their guests from ordering dessert. “Madness,” you say. Consider this. You’re charged a king’s ransom for desserts that take you three or four bites to consume—even if you’re trying to savor each bite slowly. If you want a dessert that’s worth what you pay for it, visit small town New Mexico. Visit Sugar Nymphs in Penasco. There a slab of chocolate cake is a bounteous, beauteous behemoth. You can eat a hearty portion and still save a generous half for later. There’s no scrimping on portions. Nor is there diminishment of deliciousness. The triple layer chocolate cake is probably the best in New Mexico. So is the organic carrot cake, a rich, moist, creamy slab of swoon-inducing greatness. Reminiscent of the transformative Mexican wedding cake at Mary & Tito’s, it’s chockful of pineapple and flavor. Sugar Nymphs is in the same building as the Peñasco Theater (formerly known as the El Puente) which was built in 1941 and served as the original movie house for the village. Colorful murals of local imagery (such as a woman from nearby Picuris Pueblo making micaceous pottery) festoon the entire frontage. During my youth the movie theater specialized in the cinematic exploits of both Western cowboys and the Mexican charros while the area in which Sugar Nymphs is situated once hosted a small restaurant. Sugar Nymphs has become a popular and utterly delicious reason to visit Peñasco, but while you’re there make sure you take in the Jicarita Peak which governs Peñasco’s skies like a sovereign queen perched on her throne keeping a vigilant watch over her people. I have a memory as a little kid (age 4-5) making our annual journey of misery from Minneapolis to Kansas City (famous for the invention of the chigger in my young mind) to visit our extremely old relatives. I was convinced that there was nobody in Kansas under the age of 85. We stopped at a strange restaurant in Des Moines. In my cloudy memory we climbed up a rickety wooden exterior staircase to a restaurant above a garage. On the door we saw the plaque which gave the place its claim to fame, “Recommended by Duncan Hines.” I don’t remember anything about the food. Back east many paces claim “George Washington slept here.” He must have been a very sleepy man or had a large contingent of Girlfriends. Saturday we were out cruising through the northern New Mexico mountains when I decided we should go through Penasco & stop at Sugar Nymphs. Just two months ago I was the last person on earth who refused to have a smart phone but I have rapidly become addicted to Siri giving me driving directions and telling me stupid jokes but, except for a few very small isolated areas, Siri would only reply that she would love to help but I didn’t have an internet connection. The new me could only wonder how people could live under such primitive conditions. My Mini was flying into Penasco begging for directions when I realized we were only 30-feet from a theater which was Sugar Nymphs’ front door. We went in and became deliriously happy SPLITTING a Chicken BLT with two goat cheese salads. The highlight was trying to decide on desert which we never have. Long lines of locals were picking up carry-out slices of spectacular cakes. We decided on some sort of butter cake with pear and a name I had never heard of. For a while I thought I had died and gone to heaven. All of which brings me to my main point. BOTVOLR should make Gil about 1000 bronze plaques stating “Recommended by Gil Garduno” or “Gil ate here.” Sugar Nymphs should be the first recipient. Chiggers, Jim? I spent a year in Nashville so my wife could get a Master’s at Vandy. Great town: e.g. The Atrium at Opryland Hotel AND especially when inundated with Poinsettias from Thanksgiving through New Years AND! Fried Corncake amuse-bouche at Jimmy Kelly’s steakhouse since ’37! Alas, I shoulda taken it as an omen: my new wife would walk across a lawn in sandals and a dress or Bermuda Shorts unscathed by Chiggers; dare that I used a cemented walk-way! My Gawd! Chiggers even survived Nashville’s infamous Ice Storms!!! Nasty Suckers they be!!!! YES, she is my ex! plaques should be in the making…at least a stick-on Sticker! And so, we munch on…..
– As an aside, it amazes me that about 7 out of 10 tourists go OoohAaah, as in “I’ve seen it!”, when I reference the Milagro Beanfield War produced by a semi-resident ‘environmentalist’, Redford…, given it’s an’88 film! Be all that as it may, now I have a better understanding what these pics must have been all about lest we stopped to eat in Penasco. They suggest that Gilly’s hometown was….a genetic pool for GastroPhotophiliacs!!!! Alas, as is the case with things Naturish, there’s always a chance for an anomaly….e.g. one Chica who j u s t missed The Concept!!! http://tinyurl.com/z369sns Certainly worthy of an A for effort tho! Roberto, you have a great memory though the apparition was seen not in Mora, but on a church wall in Holman, a suburb of Mora. We were among the multitudes who trekked to the morning side of the Jicarita to check it out. Let’s just say that the power of suggestion can be very strong. Yes indeed, the suburb of Holman…Thanks. I’m falling into the habit of tourists I interact with who say they are from LA instead of San Peedro or from Boston instead of Wurchestah/Worcestershire. – Eeek…you didn’t catch it either! How 41 year old memories degrade! It was apparently Christ’s image that appeared and not the Blessed Virgin Mary! Alas, I can’t find a pic altho the Associated Press did a story including reference to the Archdiocese’s checking it out http://tinyurl.com/js6xjhq . Say next time you’re up there visiting, could you check if it is still there; if not, get Linthicum to check it out and do a story on what happened to it! RE your assessment. Aha! are you admitting you didn’t see it? Whoa…you of little Fe! – Alas, I noted you did not take issue with Penasco’s Gastrophotophiliac gene pool! Interesting. As I recall, pilgrims to the site witnessed a number of sacred images on the adobe hued walls (some attributable to the strong faith of Northern New Mexican communities and other more esoteric images perhaps attributable to the increasing presence of hallucinogens in the area). I personally didn’t see any images on the wall, but I’m so grounded in reality that I may be the only technonerd in the world who can’t suspend disbelief and enjoy Star Wars because it can’t possibly be real. Alas, not many gastrophiles come from La Peña where fine-dining means traveling to the big city for lunch at Olive Garden or Red Lobster. Then again who needs big city cuisine when abuelitas can cook circles around the big city chefs? Not every village in El Norte was run by a patron (rural New Mexico’s version of a Boss Hogg-like kingpin). The most famous of the all, of course, was Emilio Naranjo who practically owned Rio Arriba county. Anyone interested in the history of New Mexico politics and the evolution of partisanship should find his bio. To keep this food related…one of the stands always had good frito pies too! Still, the GCCBs were the star of the fiestas! Yes!!! I do remember those GCCBs! Something about them just made you want to have 2 or 3 or 4. :-). I always joked that is was because the cooks didn’t wash their hands when making the patties! Hitting the carnival and playing the games, then grabbing a burger or two. Used to be a pretty happening place back in the day. You had cruisers from Espanola, Questa, Taos, Mora, you name it! It would take about 45 minutes to cruise the mile and a half stretch! It’s been about 20 years since it was anything near that :-(. I usually got stuck helping the primos with their gas station – used to an Exxon at that time, now is Mustang or something like that – but I remember Leandro giving us some money to go grab burgers and chips for the crew. Speaking of memories….back in the wild days, gang-bangers from Cordova were rumored to invade the Fiestas annually to rumble with Peñasco’s “juvenile delinquents” (as teachers called them). For some reason, Peñasco had a huge rivalry with Cordova despite the fact that they didn’t have a high school, ergo no sports teams against which to compete. To me, scouring the midway for green chile cheeseburgers was much more important than rumbling. You analysis as to what made Fiesta green chile cheeseburgers great is probably very accurate. My brother tells me most of the vendors are now using frozen beef patties from Sam’s so we’ll never know for sure. I haven’t seen Leandro in years, but run into Ray every once in a while. Visitors to Peñasco are traumatized when they see the gas prices which are generally fifty cents or more higher than they are in the Duke City. Hey Gil, just had a jumbo burger from Victor’s Drive-in! While not necessarily a very good burger, for nostalgia purposes, it brought me back to cruising up and down “Main Street” Peñasco for Fiesta de San Lorenzo. We visit my mom in Peñasco every two or three weeks, but we always eat at her home. At 39 (Jack Benny years), she’s still a wonderful cook and loves nothing more than a sit-down meal with her family. As such, we haven’t been to Victor’s in years. I also haven’t been to the Fiestas since 1976, but as I recall some of the food stands served terrific green chile cheeseburgers. We were all quite pleased with our visit. My wife and I had excellent sweet corn quesadillas; we found them unique, relatively light and delicious. My daughter ate every single morsel of her goat cheese and feta salad with chicken and raved about it—repeatedly. Her husband gave his GCCB (just as described by Gil, above) a high grade, and for him the green chile was reasonably piquant. The grandkids liked their cheese quesadillas from the kid’s menu just fine, though my granddaughter would have preferred a toasted cheese sandwich. We shared chocolate cake, rhubarb pie and chocolate maple pecan pie for dessert. We liked the cake a lot (one huge piece was enough to feed 4 people!) and chocolate pecan pie, but thought the taste of the rhubarb was masked by too much sweetness in the rhubarb pie. Service was prompt and very friendly, though it did take some time to prepare the food in the kitchen, and the prices were reasonable. We will certainly drive north again to sample their fare. Pingback: nm restaurants « I Hate Tomatoes! We went to Suagr Nymph’s Bistro as a side trip on our way to Chama. It was for lunch on Tuesday so thje menu was quite limited. Tried the goat cheese salad, the soup de jur, the green chile cheese burger, and thje maple pecan pie. The goat and the soup were fantastic. The burger undistiguished. We were very disappointed with the pie. Neither Kay nor I could detect anything maple in it and her taster is more sensitive than mine. And Kay makes much better crust at home. You describe it as light and flakey. I’d describe it as armor pleate. I tried to break off a piece to taste it by itself and could not do it. But again the goat and the soup werwe terrific! Likely try it again if we’re near the neighborhood. Service was very slow, 35 minutes to take the order, and when we asked for plates for our pizza the waitress never came back. The pizza was good, but we were upcharged $7.50 for having a 1/2 veggie and 1/2 meat pizza. When I mentioned to this to the owner she said that this was how it was done in restaurants sweetie! As if I was some hayseed that had never been to town. The truth is I have managed restaurants from coast to coast for 30 years. I will not be back and will persuade every one I know not to. Go to the pizza outback in Taos, it’s just as good, but with a patio and good service. I’m sitting here in SLC with a friend from Fort Worth discussing the Sugar Nymphs Bistro’s mushroom soup. Loved reading your review of the bistro (we have wonderful memories) and wondered if you knew if there was any chance of getting the recipe when we couldn’t find a website for the them. it was worth a try! Thanks! !